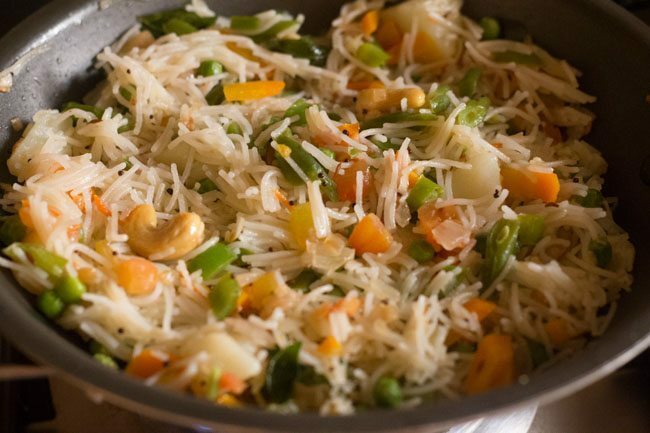 veg rice sevai upma is a delicious breakfast or snack made from rice vermicelli, steamed veggies and spices-herbs. 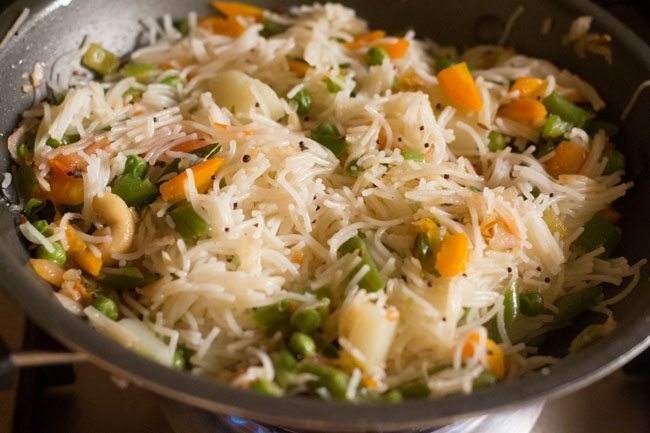 vegetable rice sevai upma recipe with step by step photos. a healthy breakfast made from rice sevai (rice vermicelli), mix veggies and spices-herbs. sharing a recipe which is a favourite at home. i have learnt this recipe from my mom. when i make these veg sevai upma, i always use rice vermicelli. though you can even use whole wheat or semolina (sooji) vermicelli for this upma recipe. 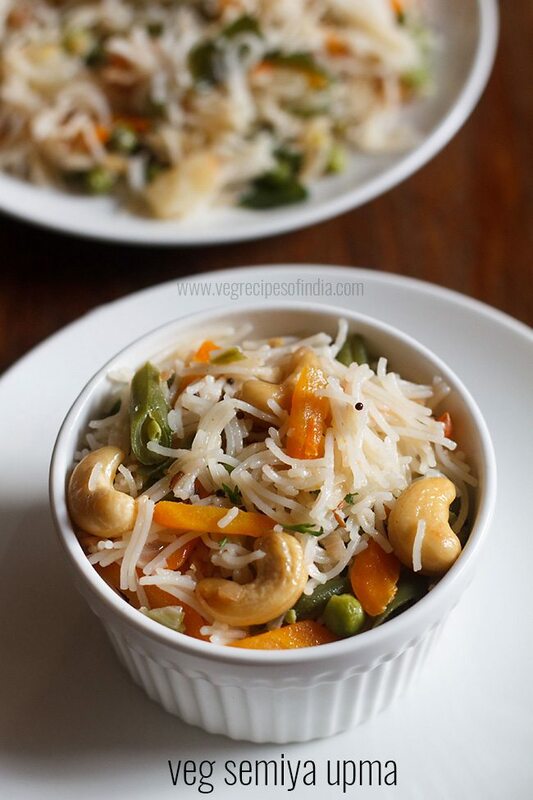 the veg sevai upma tastes delicious with a nice soft texture of the rice vermicelli which compliments the texture & the taste of the veggies and the crunchy taste coming from the cashews. 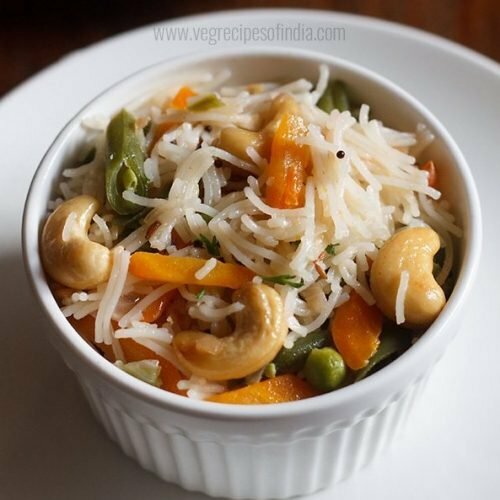 adding cashews are optional, you can also add roasted peanuts instead of cashews. i have already shared a plain version of rice sevia upma recipe. as is the case with any mix veggie dish, you can add your choice of veggies. i have here used carrots, french beans, potatoes, green peas and capsicum. veg sevai upma can be served as a breakfast or as a quick snack. you can eat this upma at room temperature or have it warm. tastes good either way. 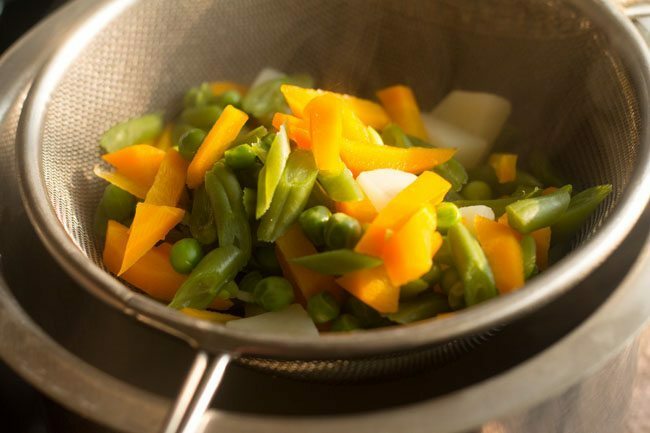 boil the chopped mix veggies with 2 cups of water and ½ teaspoon salt in a pan or vessel. 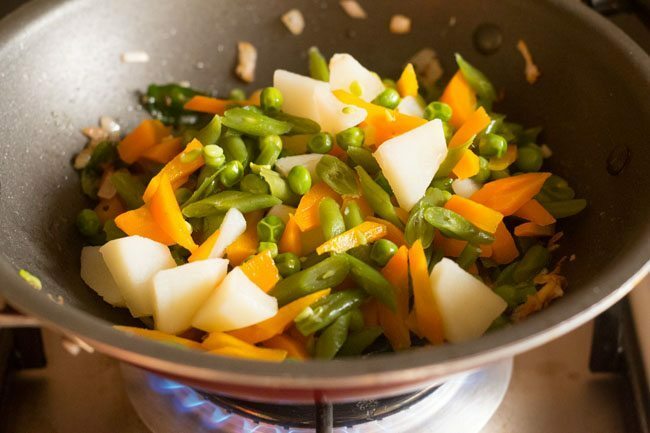 cover the pan with a lid and cook for 10 to 12 minutes till the veggies are cooked and tender. 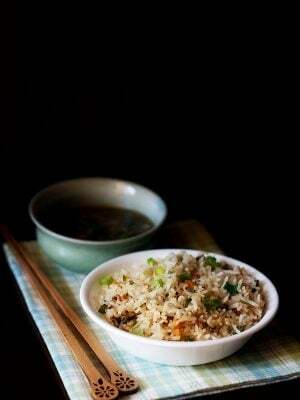 alternatively you can steam the veggies in a rice cooker or in a pressure cooker or even microwave them. 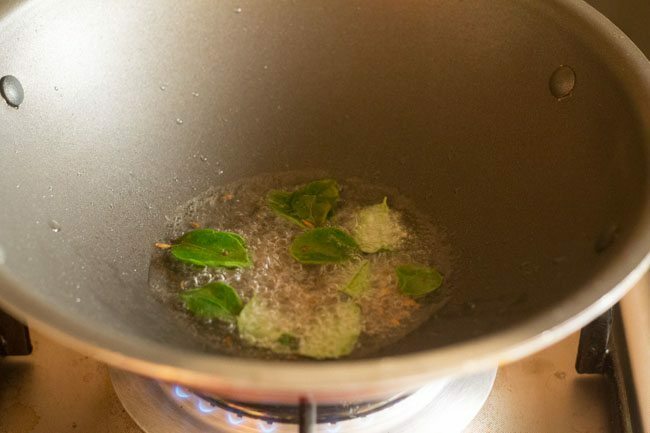 once the veggies are tender and cooked, using a colander strain them. keep aside. 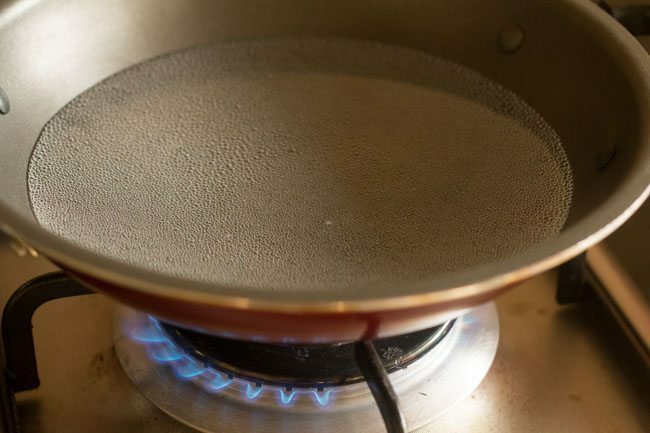 heat 2 cups of water in a pan. let the water comes to a boil or start to bubble. then add 1 cup rice sevai (rice vermicelli). simmer for 1 to 2 minutes on low flame. drizzle ½ teaspoon of oil. adding oil prevents the vermicelli from sticking. boil for another 4 to 5 minutes or till the sevai softens. keep stirring at regular intervals. drain the rice sevai in a colander. allow them to cool. 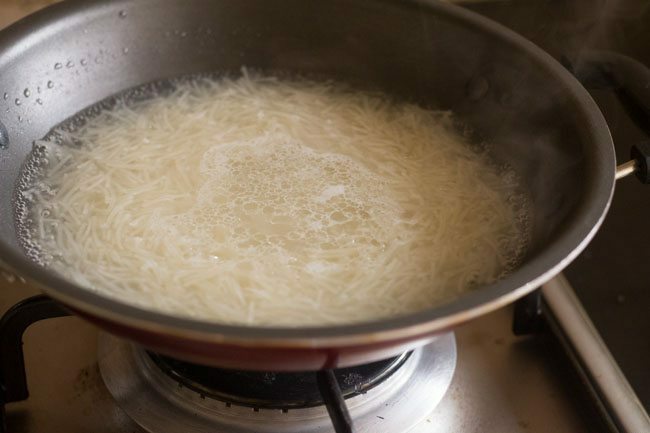 if you stir them while they are hot, then the sevai might break. so allow them to cool down. 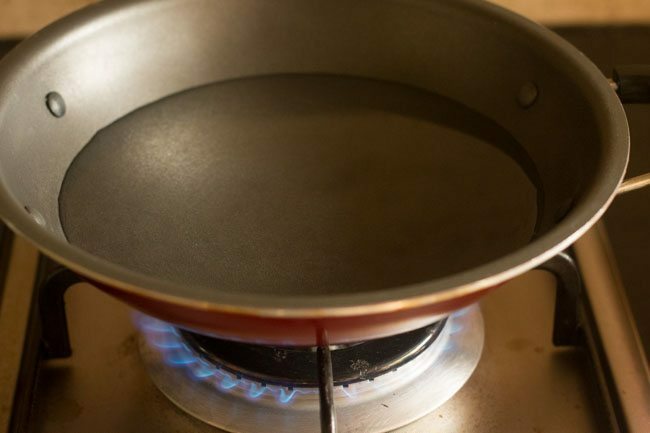 heat 1.5 tablespoons oil in a pan or kadai. add ¼ teaspoon mustard seeds. also add ¼ teaspoon of cumin seeds. once both the mustard seeds and cumin seeds crackle, then add 10 to 12 curry leaves. also add ½ inch ginger (chopped.) 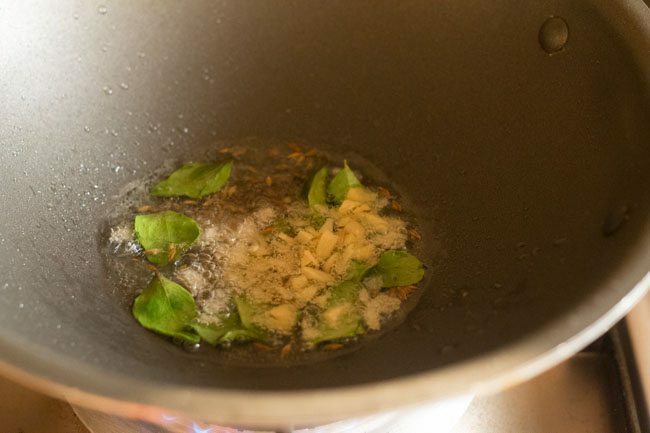 saute the ginger for some seconds, till its raw aroma disappears. then add ¼ teaspoon urad dal. 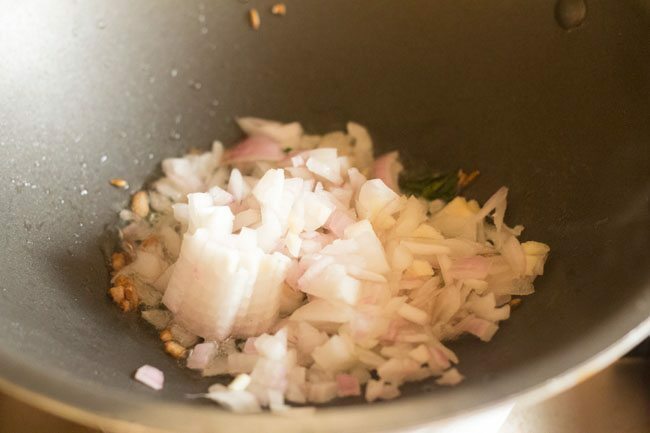 once urad dal turns golden, then add ½ cup chopped onions. saute and stir onions till they become translucent. then add 5 to 6 cashews and 1 chopped green chili. 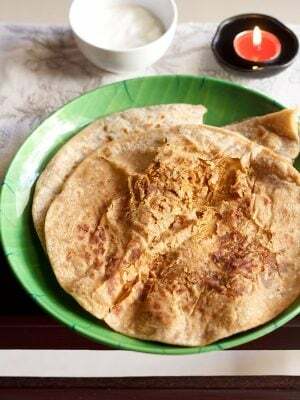 sprinkle a generous pinch of asafoetida. stir well. 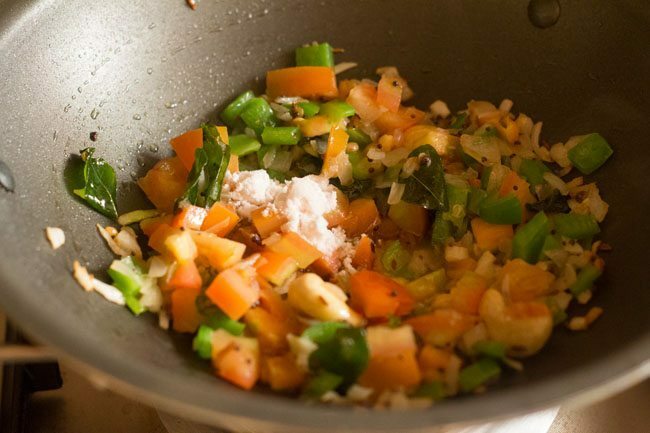 add ¼ cup of chopped capsicum. stir and mix well. next add ⅓ cup of chopped tomatoes. stir well. saute for 2 to 3 minutes or till the tomatoes soften. add 1 teaspoon of salt or add as per taste. again stir well. now add the boiled or steamed veggies and mix well. add the cooked rice sevai. stir gently so that the vermicelli don't break. just cook for a minute more on low flame. then switch off the flame. 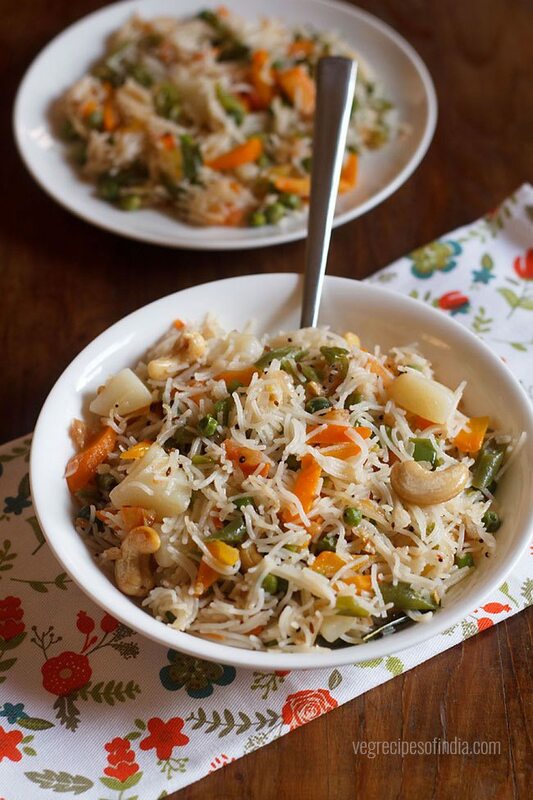 serve the veg rice sevai upma hot or warm as a snack or breakfast. 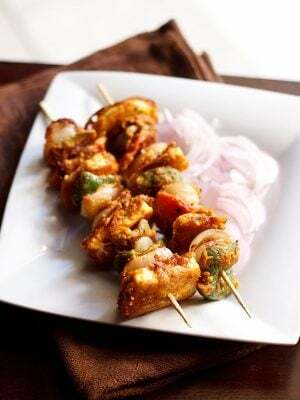 you can garnish with some coriander leaves while serving. do drizzle some lemon juice before savoring the upma. adding cashews are optional, you can also add peanuts. 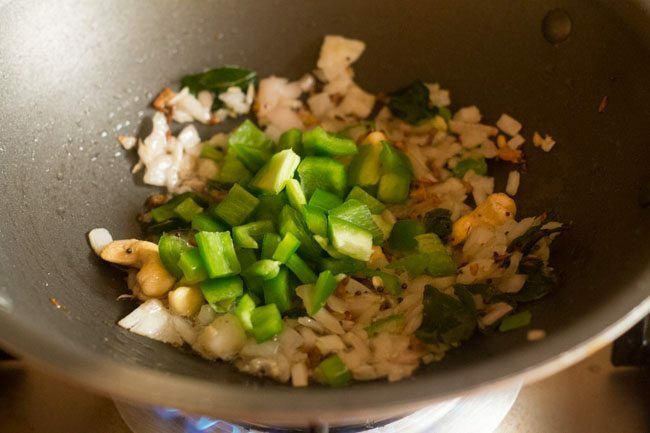 if you like more spicy upma, then add more green chilies. you can easily double or triple up the recipe. 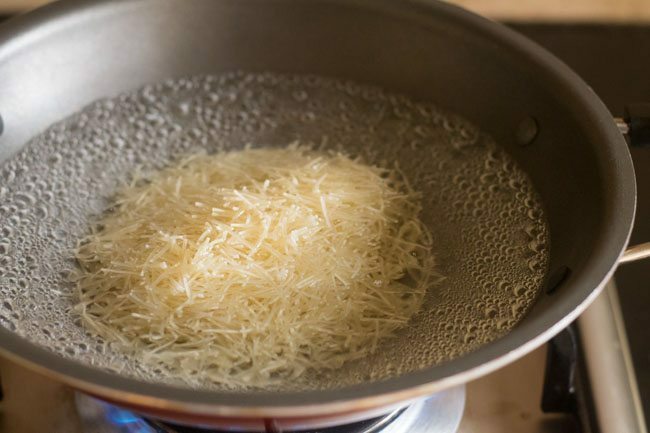 also any kind of vermicelli like wheat vermicelli or maida vermicelli can be used for this recipe. if you chop the potatoes into thin cubes or slices it will cook faster. 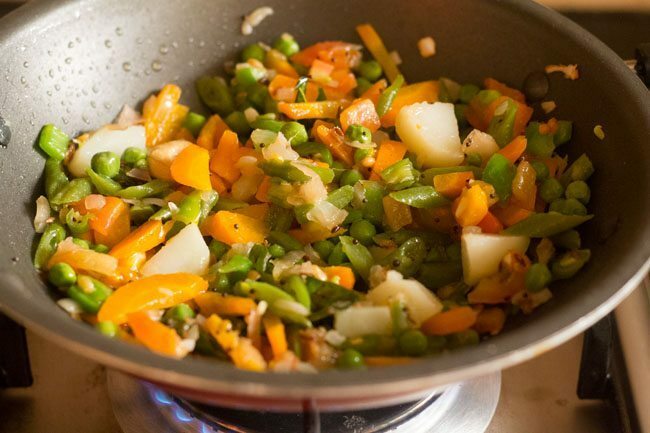 1. boil the chopped mix veggies with 2 cups of water and ½ teaspoon of salt in a pan or vessel. 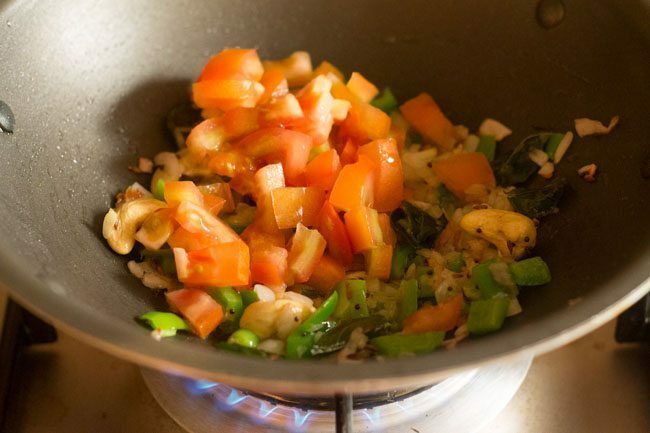 2. cover the pan with a lid and cook for 10 to 12 minutes till the veggies are cooked and tender. 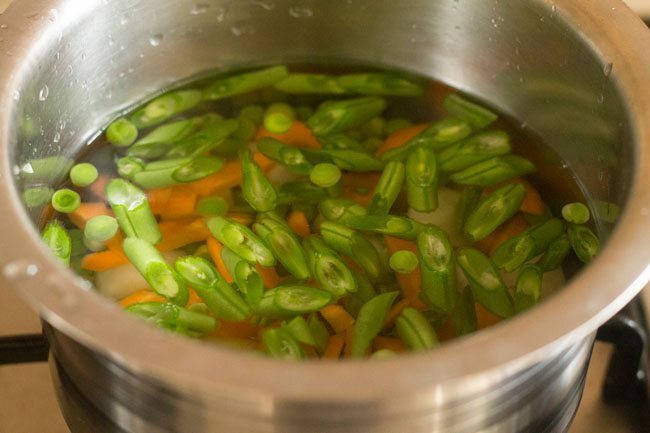 alternatively you can steam the veggies in a rice cooker or in a pressure cooker or even microwave them. 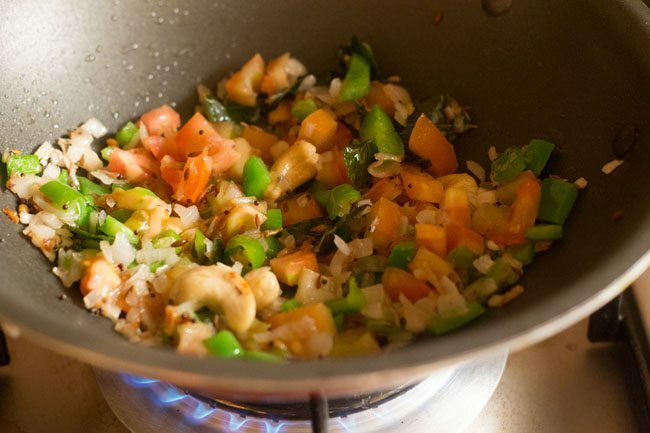 3. switch off the flame, once the veggies are tender and cooked. 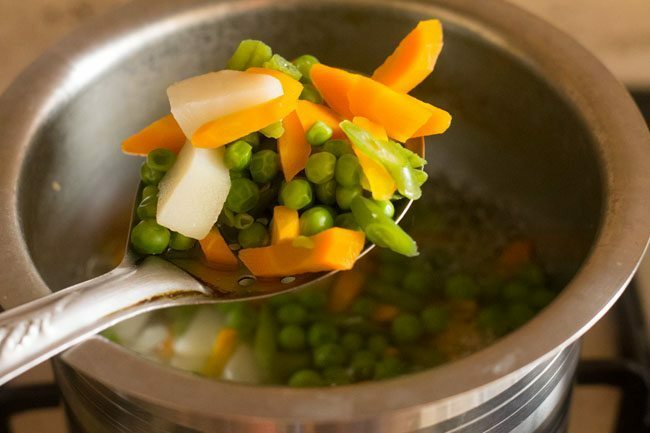 4. drain the boiled veggies in a colander. keep the veggies aside. 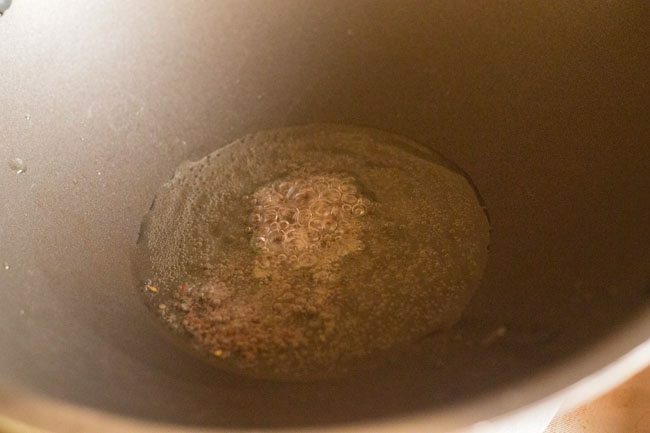 5. heat 2 cups of water in a pan. 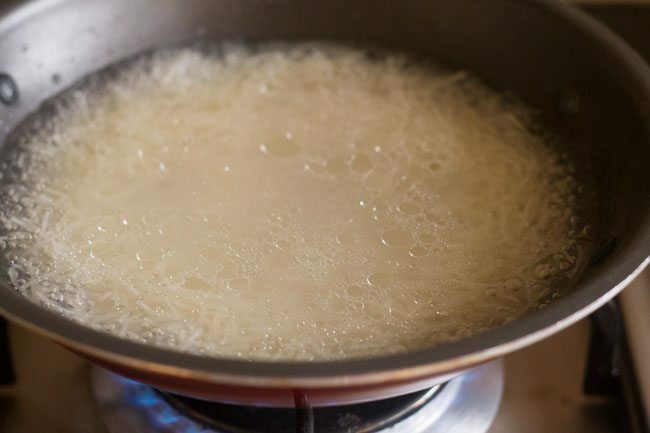 6. let the water come to a boil or start bubbling. 7. add 1 cup rice sevai (rice vermicelli). 8. simmer for 1 to 2 minutes on a low flame. 9. drizzle ½ teaspoon of oil. 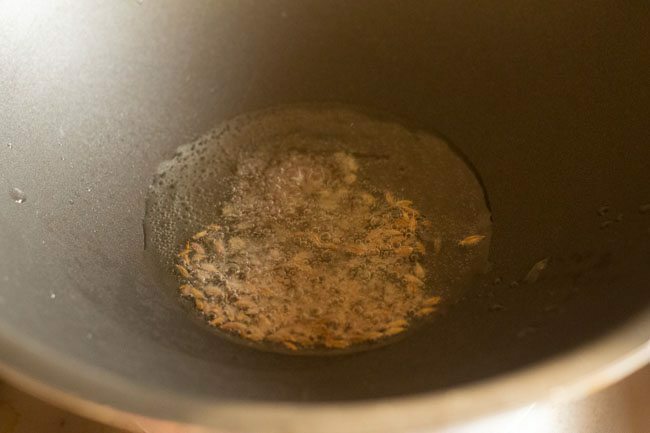 adding oil prevents the vermicelli from sticking. 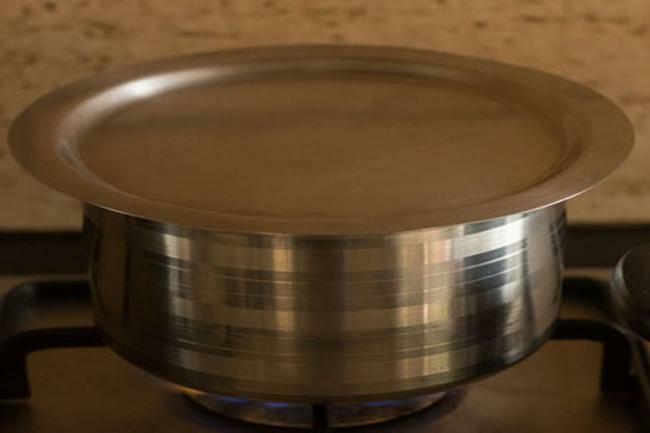 10. boil for another 4 to 5 minutes or till the sevai softens. keep stirring at regular intervals. 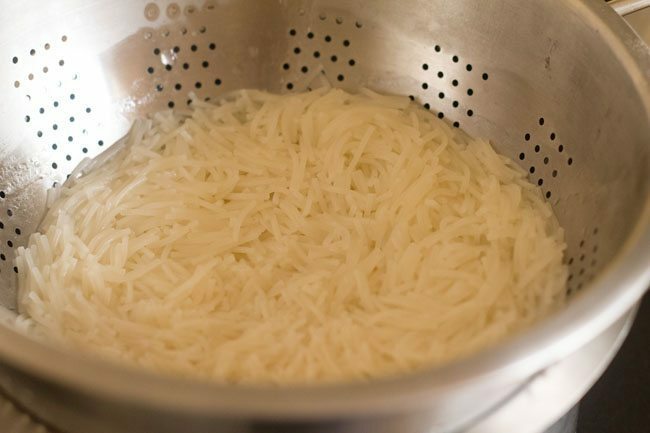 11. drain the sevai in a colander. allow them to cool. 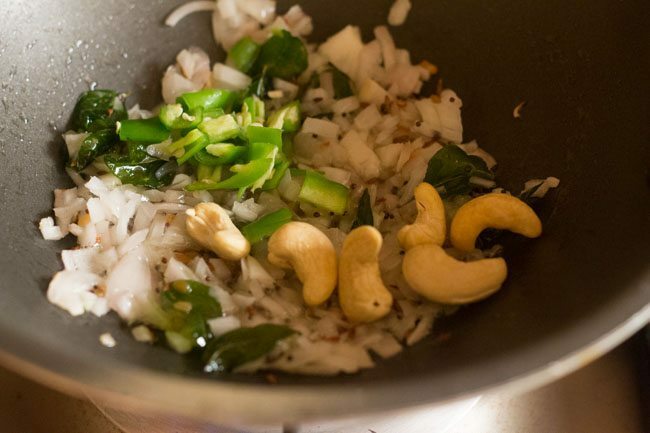 if you stir them while they are hot, then the rice sevai might break. so allow them to cool down. 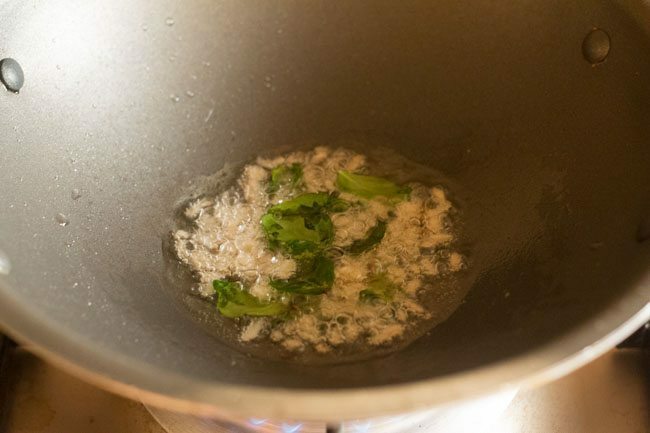 12. heat 1.5 tablespoons oil in a pan or kadai. add ¼ teaspoon mustard seeds. 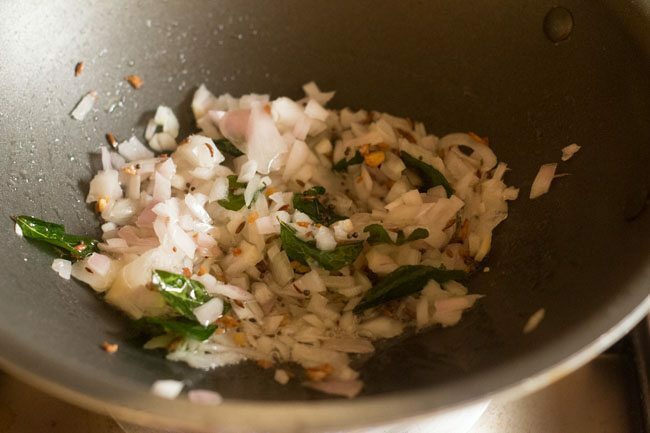 13. also add ¼ teaspoon cumin seeds. 14. once both the mustard seeds and cumin seeds crackle, then add 10 to 12 curry leaves. 15. also add ½ inch ginger (chopped.) 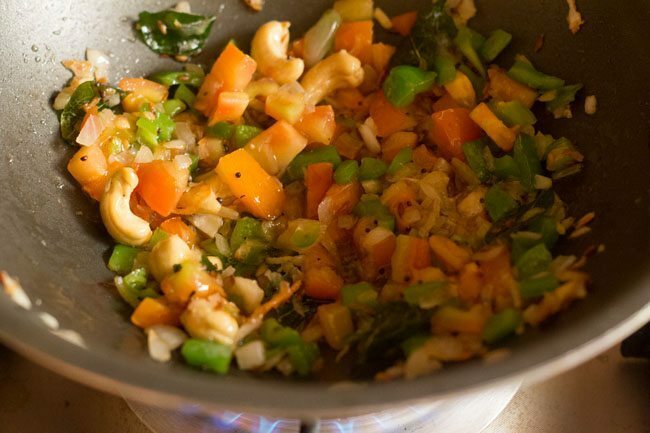 saute the ginger for some seconds, till its raw aroma disappears. 16. then next add ¼ teaspoon urad dal (split and husked black gram). 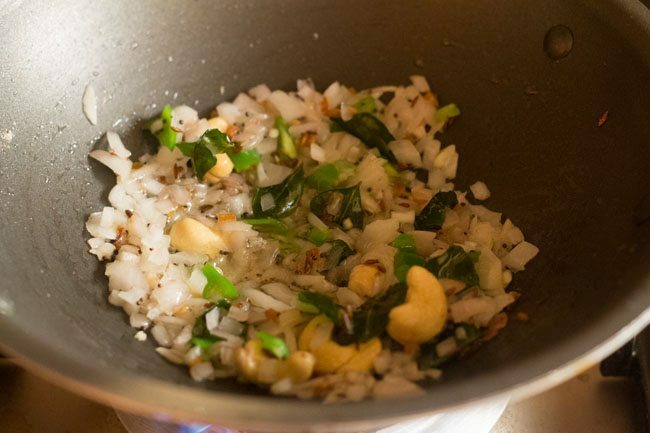 17. once urad dal turns golden, then add add ½ cup chopped onions. 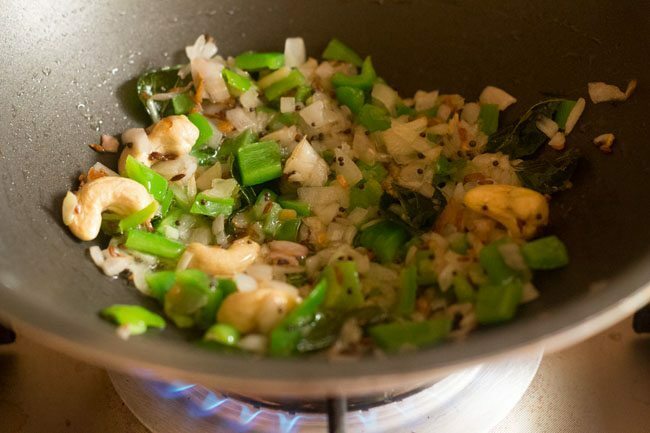 18. saute and stir onions till they become translucent. 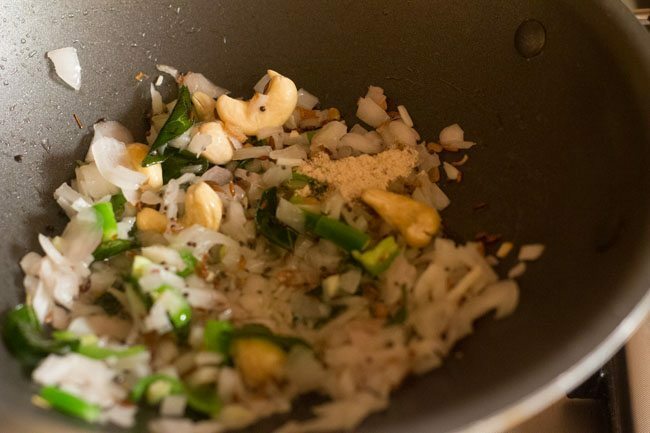 19. then add 6 cashews and 1 chopped green chili. 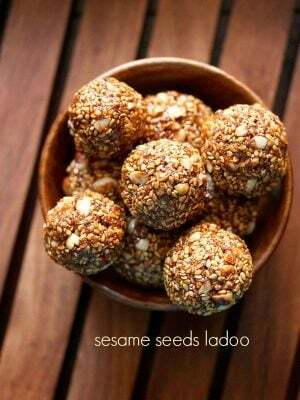 20. sprinkle a generous pinch of asafoetida (hing). 22. next add ¼ cup chopped capsicum. 23. stir and mix again. 24. next add ⅓ cup chopped tomatoes. 25. stir well. saute for 2 to 3 minutes or till the tomatoes soften. 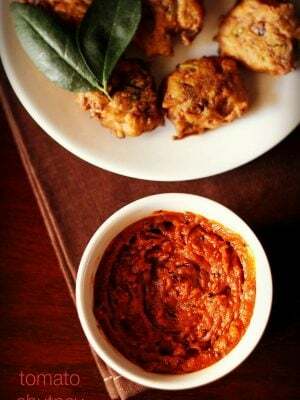 26. add 1 teaspoon of salt or add as per taste. 27. mix the salt with the rest of the ingredients very well. 28. now add the boiled or steamed veggies. 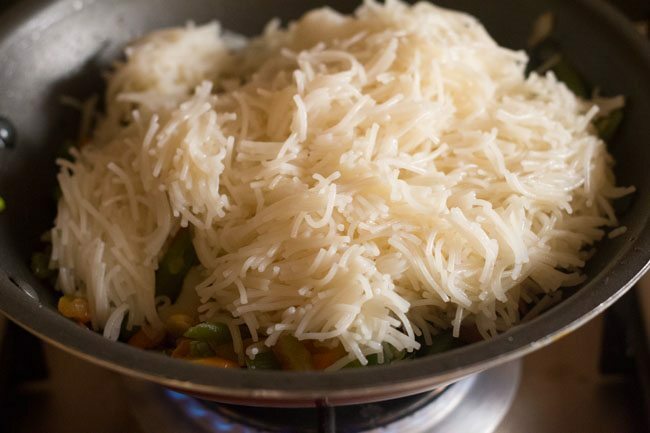 30. add the cooked rice sevai. 31. mix and stir gently so that vermicelli don’t break. 32. just cook for a minute more on a low flame. then switch off the flame.